Socially engaged art history is produced within and between social groups over an extended period of time, it will seek to engender a productive dialogue regarding political and social issues and to foster resilient and sustainable communities. Its focus will be on difference, division and inequality in society. It may or may not result in a publication. As collaborators and advocates for the future of art history, we at Art History That had the honor to present our paper “What Has Art History Done for You Lately? Initiatives for a Social Practice.” The direct address in our title reflects our preoccupation with pronouns and the communities they can represent, activate, and exhort. Pronouns matter, as Robert Storr demonstrated in his polemical 2013 CAA conference convocation address. If art history is going to thrive going forward, it must be a more inclusive community, a more socially engaged “you,” “me,” and “we.” To that end, our presentation showcased four exemplary initiatives in the realms of political activism, pedagogy, public engagement, and communication networks. Our goal in this strategy of trumpeting promising initiatives in our field – one that we promote on our website – is to catalyze the sorts of chain reactions that Linda Nochlin identified in her 1974 essay on feminism and cultural change. Indeed, we believe that feminist art history is the original socially engaged art history. Next up in the session was Laura Holzman’s paper “Beyond the Exhibition? Art History as Public Scholarship.” Holzman is an Assistant Professor and Public Scholar, Curatorial Practices and Visual Art at Indiana University-Purdue University Indianapolis. That “public scholar” in her title was the topic of much discussion in the Q&A and beyond, some of it envious admiration. Such a title is instant validation for the community engagement we were all there to discuss. Holzman introduced IUPUI’s definition of engaged scholarship, which: “incorporates explicitly democratic methods that encourage the participation of non-academics in ways that enhance and broaden engagement and deliberation about major social issues inside and outside the university and involves collaboration…for the mutually beneficial exchange of knowledge and resources.”(IUPUI Center for Service and Learning) She then described the project We Are City, a loose collective addressing issues of visual culture and contemporary urban living in Indianapolis, partnering with, among others, The Bureau of Manufactured History. Holzman spoke of the exhibition she crafted, insisting on the curatorial part as “a vital path for socially engaged art history, especially community responsive projects.” Finally, Holzman was clear about her collaborative role, and the need for compromise and humility. Their “Export” in the form of a stylish, downloadable pdf or book flags the essential “we” in the project’s title, summarizes the many complex threads, and guarantees the retrievability of the hard work of many. Holzman was followed by Christopher LeClere’s presentation on “The Confluence of Anthropology, Art, and Design: Using Visual Anthropology to Study and Represent a Subcultural Group.” LeClere, currently completing his master’s degree in Ethnographic Documentary/Visual Anthropology at The University of Manchester, spent six months living with members of of The Society for Creative Anachronism and translated that work into a feature-length documentary called Scadia. LeClere’s notion of “creative archaeology” and his exploration of play and performative space gave us much to think about with respect to art history. It behooves art historians to find common cause with other scholars in the humanities and social sciences. Anthropologists in particular are trained to think about visual culture in a way that we can learn from. As one that integrates anthropology with art and design, LeClere’s project is interdisciplinary and also takes social engagement as a given. Imagine a similar project anchored in art history; what might it look like? Kelly Wacker’s “Art History in an Expanded Field” offered an intelligent riff on Rosalind Krauss’ “Sculpture in the Expanded Field” first by tracing the genealogy of the long-standing partnership between art and science, and second by demonstrating how her teaching and research assume that “art and art history have a place at the sustainability table.” For example, her art history course on “Art and the Environment” takes her University of Montevallo students out into the landscape of Central Alabama, tasking them with observation exercises using Claude Glasses they make themselves. This sort of socially engaged art history encourages students to claim their roles as local and global citizens of a planet beleaguered by climate change. 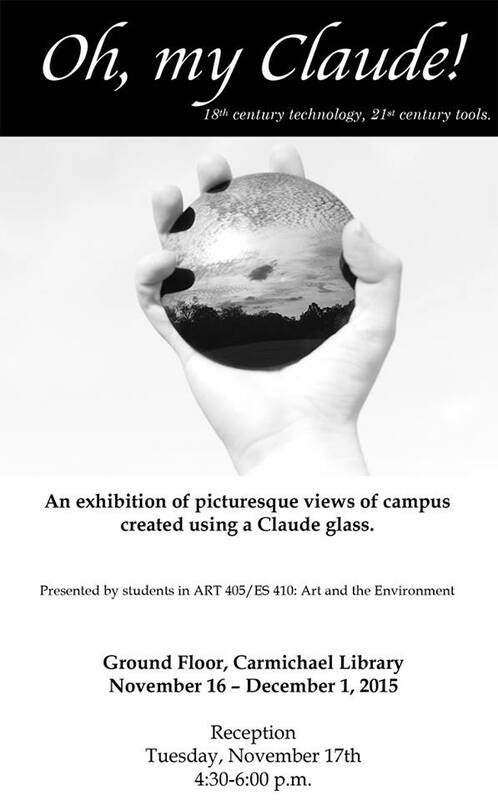 It also has concrete outcomes for students in the course, who recently curated an exhibition, playfully titled “Oh, my Claude! 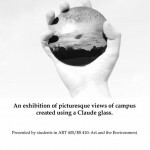 : 18th century technology, 21st century tools”, that features photographs of campus locales created using a Claude Glass. The participants in “Socially Engaged Art History” will allow us to continue our tradition of providing a megaphone for their excellent initiatives. All will be featured on a dedicated page of our website, to be published in early December, 2015. There is no theory without praxis, Rob Storr reminds us. Thus, there was a necessity to put some money where our mouths were, in terms of community building, collaboration, and engagement. Enter the Material Collective, a group of medievalists, “dedicated to fostering respectful intellectual exchange and innovative scholarship in the study of the visual arts, in the academy, and in the broader, public sphere.” Together with Material Collective members Jennifer Borland and Louise Siddons, we organized a gathering to continue discussing the ideas presented in the session, invited others into the conversation, and broke out of the confines of the conference room. In our flyer, distributed to all conference attendees, we wrote: “We believe that socially engaged art history can grow out of experimentation, risk-taking, and play, as we pursue a lyrical and adventurous style of art history along with more ethical, collaborative, and supportive approaches.” This language, echoing the spirited Material Collective manifesto, imagines an invigorated and sturdy art history. 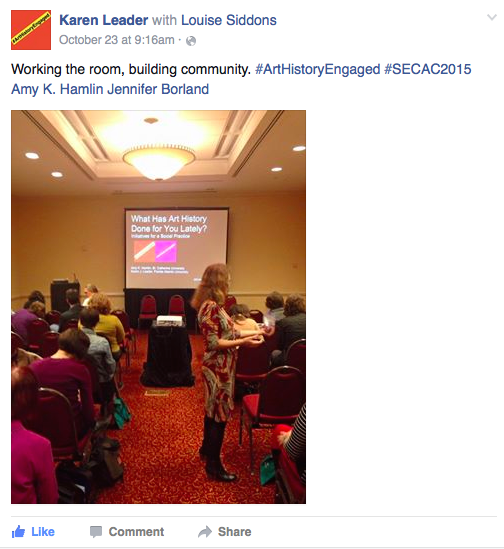 This event was the official launch of #ArtHistoryEngaged, complete with logo and buttons. We fully admit to emphasizing the “play” in this iteration of the initiative. 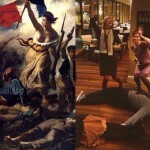 In order to create a memorable experience rather than simply host a cocktail party, we cajoled our guests (after sufficient lubrication with adult beverages) to play art history charades. The pictures speak volumes, and there is no doubt that the introduction of this kind of shared adventure deepened the bond and created permanent memories. Art History That! Throughout our time working on Art History That – and now #ArtHistoryEngaged -we have been struck by two important, though contradictory observations. On the one hand, there is truly remarkable energy and innovation in all fields/practices of art history. Simply perusing the initiatives pages on our website should make one optimistic for the future of the discipline. On the other hand, the general public perception of art history suffers from charges of irrelevance or, worse, elitism. Despite the fact that millions are exposed to, enjoy, and benefit from art history each year, from college classrooms to museums to art fairs, we have found that art historians aren’t necessarily skilled at communicating its many societal values (this is true of the humanistic disciplines in general, art history just has more visibility). How to broadcast the first, in order to overcome the second? 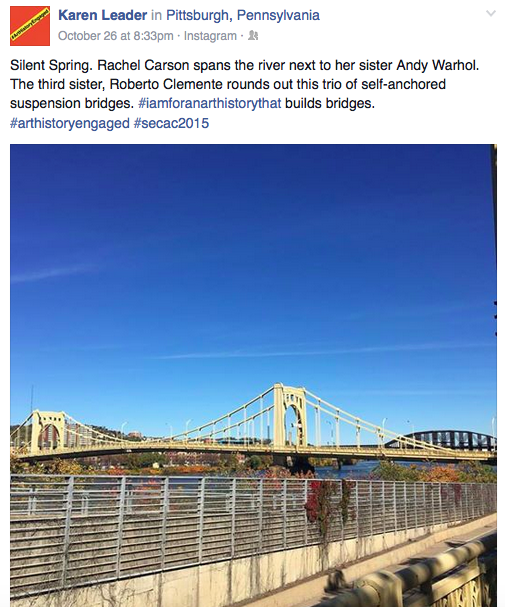 Socially Engaged Art History at SECAC is an example of the kind of bridges that can be built, between creative and committed individuals across geographic and disciplinary divides. While actively tweeted and instagrammed to give our interactions a longer reach, and an archive, the parties involved benefitted immeasurably from true, face-to-face interaction. 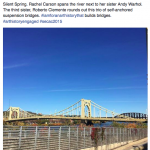 By attending to local art histories, in this case Pittsburgh as the wonderful “city of bridges,” we aimed to emphasize the significance of community and the public commons. In our flyer, we asked: “How might we integrate our local or regional art histories in conversations about cultural ownership and civic participation? How might we think with art history to encourage a more nuanced public discourse around our most urgent global problems?” #ArtHistoryEngaged builds bridges through bytes, but also through handshakes. Join us online and in person.